Review by Lucy Hilton, Manchester Social 101. I have a strong belief that it’s the little details that are vital. Little things make big things happen. With most restaurants glazing over the final touches of food, service and presentation and embellishing on the overall outlook I became accustomed to all the “za za” but no “zoom”. Therefore when I arrived at the hyped-up new Botanist on Deansgate I couldn’t help but be attracted to the stunning features of the decor. If you have ever visited the building’s predecessor, Label, you would think you had entered a completely different premises – gone is the dark, dull gloom of the interior and in its place is a spacious, welcoming bar area and separated dining room. The opening area was spectacular, after being welcomed by a host at the door my eyes were immediately drawn to stunning chandelier above the long, well-lit bar filled with reams of every liquor imaginable – which really didn’t help my indecisive nature. Beyond that, separated by an arch, was what I can only describe as an intimate dining room with both twinkling lighting and greenery which reminded me of the most beautiful mid-summers’ eve. Once escorted to our seat I realised just how much thought had gone in to every inch of the venue’s design. Not only did the furnishings resemble a peaceful secret garden but the menu’s were so delicately and prettily contrived to incorporate the theme. It was the attention to detail in this new establishment which really caught my eye. The place screamed city status made exquisitely for the busy socialites and foodies. So after I stopped gushing about the premises and actually took time to study my menu I saw an array of comfort food and as it was a Sunday it incorporated the mother of all dishes – the traditional Sunday roast. But despite temptation (after the neighbouring diners were tucking into what looked – and smelled – like the perfect roast with all the trimmings and the largest Yorkshire pudding I have seen in my life) I was feeling adventurous and go for a mix of different dishes. Therefore to start we chose cumberland and pork chipolatas with honey grain mustard and calamari with lemon mayonnaise. Service was very quick, polite and efficient and orders were taken and food arrived very swiftly with a friendly smile. 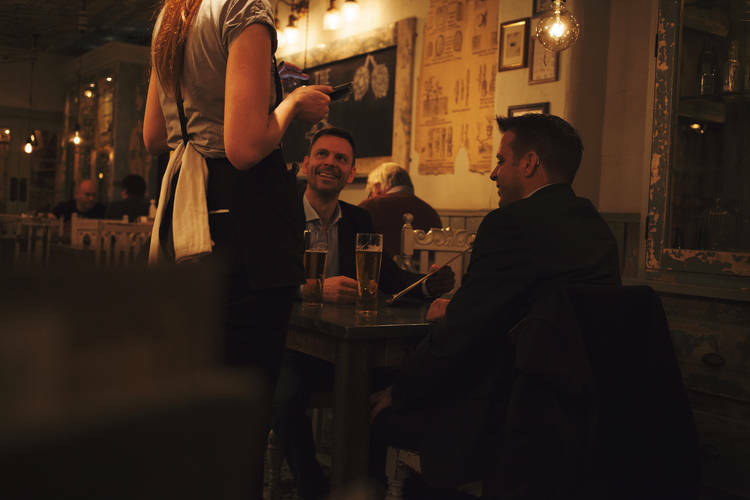 Something I always look for at any food establishment – nothing can put you off your food quicker than a scowling waitor or waitress clearly hating life because they have to interact with people – who would have thought it working at a restaurant? And I was most impressed with the kind waitress whom explained in detail any choices on the menu I was unsure of. Following on with the quirky, homely, country theme the china which held the food was mis-matched and reminded me of my regular summer stays with grandparents – cosy, comfortable and convenient. It was the type of personal touch which immediately brought back fond memories from my youth. Calamari, being one of my consistant favourites lived up to expectations. It was full flavoured without being too chewy or tough and the hint of lemon in the mayonnaise complimented it perfectly. As with the chipolatas, there was no tough gristle in the meat and it literally oozed with just the right amount of flavoured juices. It was the kind of foods you craved after a long day in the office – home comforts and filling – something your 80-year-old nan would be proud of serving up on a crisp Autumn afternoon. I was filling up after my first course but I was already craving my second. It was moreish and addictive. Next I chose the smoked haddock rarebit with spinach, tomato and piri piri dressing whereas my dining partner went opted for the thai green curry with coriander rice – although changed it to boiled rice on order. Having actually never tried rarebit in my life I must admit I was slightly dubious about the outcome – the dish sounded like a far cry away from my ‘comfort zone’ amongst the array of comfort food. But I must admit once it came my opninion quickly changed. Admittedly, at first glance on the plate it looked more like lasagne than fish but effort had been put into the presentation and on my first mouthful I instantly felt back at home. With a mix of flavours amonst the soft middle I was in Sunday heaven. It was just the type of delicacy needed to warm your insides at the end of a manic week. I was content and I couldn’t get enough of this ambience of mid-summers’ delight. The fish crumbled under my cutlery and the range of sauces encouraged the light main dish to fill my stomach. My dining partner, despite regularly claiming her fullness couldn’t stop eating her dish, even stating it was one of the best thai curries she has tried in years. I actually didn’t want the supply of food to end. But it did – it all disappeared much to my huge disappointment. Not wanting to give up just yet we both ordered a mix of ice creams at the end. This, I have to admit, was my only disappointment. Usually I adore chocolate ice cream – I’m a female what do you expect?! But after feeling all warm and fluffy after my cosy meal I just felt a bit deflated. It was slightly tasteless and bland. Although the vanilla was more inviting it still didn’t ignite any senses. Not bad. Just not what I was expecting after my last hour of restaurant gushing. It was like The light, fluffy, creamy goo just transpired into a watery mess. But it didn’t rain on my parade – the whole experience was like my butter to my bread – not always needed but oh so very necessary to help forget the working week blues. And the busy yet not-overcrowded venue was topped off with live intimate music overheard from the bar section of the premisis. A fun and comfortable atmosphere to suit a range of ages and tastes. Feeling like a spoiled grandchild back in my grandad’s cosy kitchen I thoroughly enjoyed every single minute of the magical mid-summer’s dining extravaganza. It was a Sunday sensation on every level.